How far is Europe from an area of 'free movement' of judgments in the same way that there is free movement of goods, persons, services and capital? Just as the free movement of goods has required the harmonization of standards relating to the manufacture and distribution of goods, the free movement of judgments will require the harmonization of procedural standards and the creation of new interfaces between systems. Focus has been on the mutual recognition of judgments. The next stage is the actual enforcement of a legally enforceable judgment, and this book is the first major contribution to comparative scholarship on this topic. The differences between the systems of civil procedure in the European Member States are deep-seated and relate in particular to different approaches to judicial organization. The development of appropriate rules for the European Judicial Area is a complex task. Practitioners typically do not have the time or the incentive to explore the reasons for the difficulties they face in cross-border disputes. Policy makers lack input from practitioners. A framework needs to be created within which detailed comparative information can be provided on subjects that are of interest to policy makers so that structural differences can be properly taken into account. 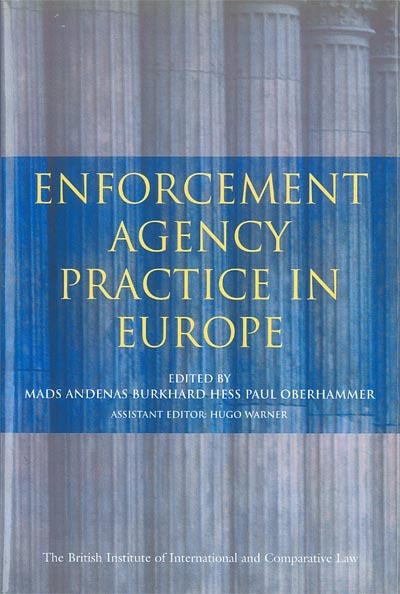 This book examines the structure, status and procedures of enforcement agencies in Europe and the implications for individuals and companies in seeking to enforce a judgment in the European Judicial Area. The project is part of a more ambitious programme and a research network on European civil procedure based at the British Institute of International and Comparative Law. "Enforcement Agency Practice in Europe"